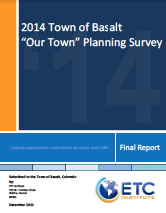 The Planning & Zoning Commission held a public hearing on Tuesday, October 20th at Town Hall for the purpose of considering adoption of the proposed amendments to the 2007 Basalt Master Plan. Click here to view Resolution No. 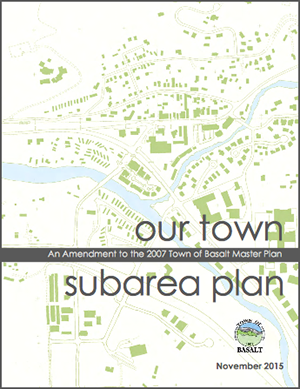 01, Series of 2015 adopting the Our Town Subarea Plan. On Tuesday, November 24th, the Town Council held a public hearing to consider adoption of the Our Town Planning amendment to the 2007 Master Plan. The amendment was adopted via Resolution No. 54 and a following Resolution No. 55 provides ‘next steps’ direction to Staff, Planning & Zoning Commission and POST.